I am considering buying a property in Detroit, renovating it and renting it out. I was wondering if I have a good chance of renting the property out in this part of Detroit, what vacancy I should expect, how much rent is reasonable per living unit and what the return percentage is I can expect. The asking price is 50000USD. I plan to buy it without a mortgage. The property consists of 6 apartments. The total area is 7000 square foot. Assuming each unit is approximately the same size this gives us approx 1166 square foot per unit (=108 square meters). The property needs total renovation, my estimated cost for renovation is 100000USD. I've compared rental prices in the area and I think $500 per unit per month is acceptable. Are my estimated costs too high or too low? If so please let me know. Is my 15% return rate a realistic assessment? What would you personally say the property is worth in its current condition, is it worth the asking price in your opinion. It seems likely that this place has been vacant for more than 10 years. It sold in 2005 for $52k, that price suggests it was vacant at the time. This area of Detroit has not been recovering nearly as well as others, and the timeline for recovery is pure speculation. Meanwhile, downtown Detroit is seeing a surge in large apartment projects, which will likely slow recover of the less popular surrounding neighborhoods. I'd wager that you under-estimated renovation costs, a lot of these blighted buildings are basically needing to be completely rebuilt, no idea what that would actually cost here, but $100k seems like it could be gone quickly. 6x kitchens worth of appliances, cabinets, and counter-tops; 7,000 square feet of flooring; new roof maybe; 40+ windows; a dozen or more doors; framing, drywall, and paint; at least 6x bathrooms worth of showers/baths, toilets, sinks, etc. You didn't budget for insurance, and I'm guessing your maintenance costs are too low. All that said, I've been tempted to buy in Detroit myself, not because I think I can cash flow in the short-term, but because it seems like eventually it will recover. The reason I haven't done so yet is because I'm not very confident in a recovery timeline, or even if certain areas will recover. 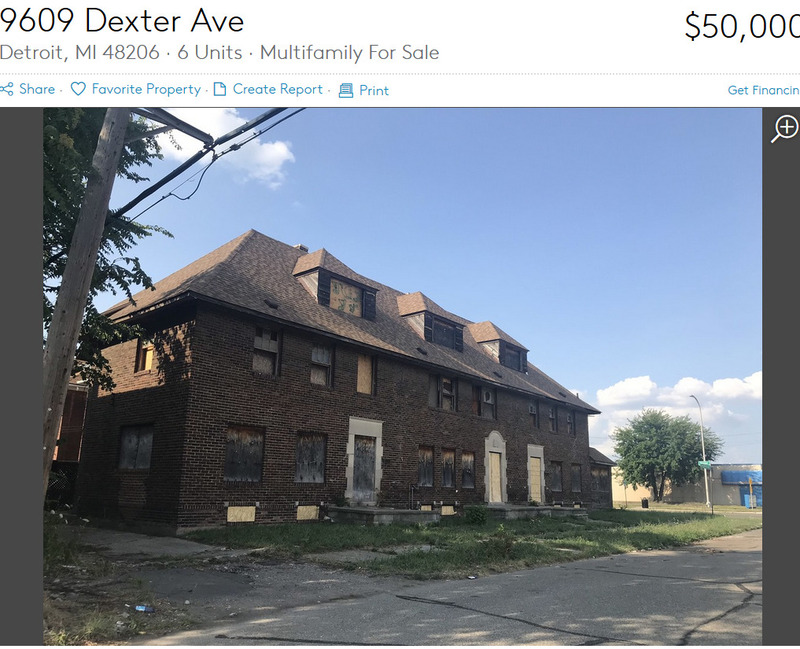 The investors more familiar with the Detroit housing market and laws have the advantage, so for me it would be more gamble/speculation than investment based on solid figures. At the minimum, I think you'd want to tour the area and get a feel for it, and definitely get a thorough inspection before moving forward.